Dust, and the smell of dust, is everywhere. 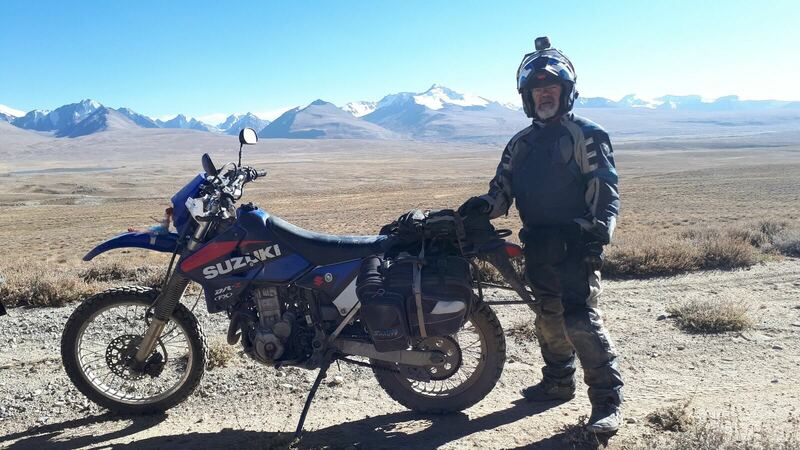 It defines every crease and seam of my riding gear like a monochrome relief map of the mountains we are riding, my boots and gloves are white rimed with it and my face a grimy mask of the stuff. I am knackered, 9pm bed tired, but first there is delicious homemade soup and bread to eat and the day deconstructed with the friends I have developed over the last 7 intense riding days. 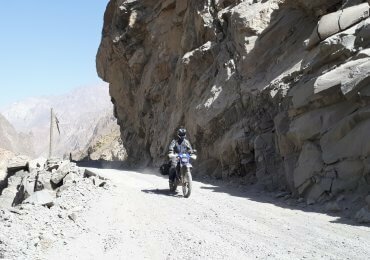 Today we are talking about riding in the Bartang Valley, which we turned into from the Pamir Highway, where we rode the chain link fence that marks the border with China. Add into the day a 4,600 metre pass, a stomach churning snake of a dirt road pass with a parachute drop inches from my right boot, a thigh-high river crossing, and every form of off road riding conceivable, and I think it’s fair to say this has been one of the best riding days in my 40 plus years riding. Strange, I said the same thing yesterday as I stared at the slopes of Afghanistan just a small river crossing away. Oh, and the day before when the bikes flew across a valley so wide that the nearest comparison I can think of would be with a pilot flying in an empty sky. We have climbed to 3000 year old Silk Road fortresses, soaked in natural hot springs and stood open mouthed under star filled night skies and at a wall of white topped mountains 7000 metres tall. We are light years from Civilisation. 10 days from now I will stare in wonder at the carefully crafted heart on the top of my coffee in some back at home café, remember the woman baking bread at 4 am on the wood fired stove outside her home, and feel embarrassed at the veneer of ‘sophistication’ that masks our day to day boredom. This has been a life changing trip. More please.